A roar of applause erupted, someone shouted and half of the room stood as President Donald Trump called for a ban on late-term abortion at the State of the Union address Tuesday night. 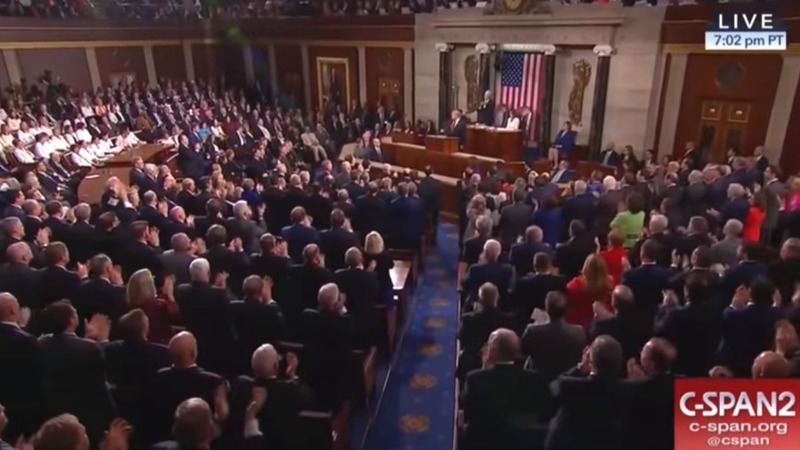 A majority of Democratic leaders attending the address refused to clap or stand. A majority of Democratic leaders attending President Donald Trump’s State of the Union address Tuesday night refused to clap or stand when the president called for a ban on late-term abortion. “To defend the dignity of every person, I am asking the Congress to pass legislation to prohibit the late-term abortion of children who can feel pain in the mother’s womb,” Trump said. His remarks refer to the Born-Alive Abortion Survivors Protection Act, introduced Monday by Nebraska Republican Sen. Ben Sasse. The bill would mandate that babies born in abortion clinics be immediately given medical attention and taken to the hospital. Republican lawmakers stood and clapped vigorously, while a majority of Democrats remained in their seats. West Virginia Democratic Sen. Joe Manchin is seen standing and applauding the president’s call to action. “All you need to know about the radical abortion sentiments of the Democratic Party leadership can be seen in House Speaker Pelosi bringing the president of Planned Parenthood as her special guest to the State of the Union,” Students for Life of America President Kristan Hawkins said in a statement. Trump’s remarks come amid a number of proposals to expand abortion access. Rhode Island is considering a bill that would allow the abortion of post-viable babies for reasons extending beyond the preservation of the mother’s life. Vermont is considering H-0057 which would give women the right to abort a baby at any time and for any reason up until birth. “Every individual who becomes pregnant has the fundamental right to choose to carry a pregnancy to term, give birth to a child, or to have an abortion,” the bill reads. Virginia’s HB 2491 would repeal the state’s current restrictions on late-term abortions. The bill would allow a doctor to perform an abortion when a woman is dilating, meaning she is about to give birth. The proposal eliminates the state’s requirement that second and third-trimester abortions be performed only to preserve the health or life of the woman. New York passed the Reproductive Health Act Jan. 22 expanding abortion access and codifying a woman’s right to abort under state law. The law removes abortion from the state’s criminal code and allows women to have abortions after 24 weeks in cases where “there is an absence of fetal viability, or at any time when necessary to protect a patient’s life or health,” according to the legislation. Maryland, Maine and New Mexico are also considering similar bills expanding abortion access, according to the Associated Press.